James Cross (1828 – 1882) and his wife Ellen Cross née Murray (1837 – 1901), the great great grandparents of my husband Greg, moved to Carngham between the births of their first and second children. Frederick James Cross, their oldest son, was born on 1 April 1857 at Green Hills near Buninyong. Their daughter Ellen was born on 27 May 1859 at Carngham. James and Ellen had nine more children all born at Carngham. 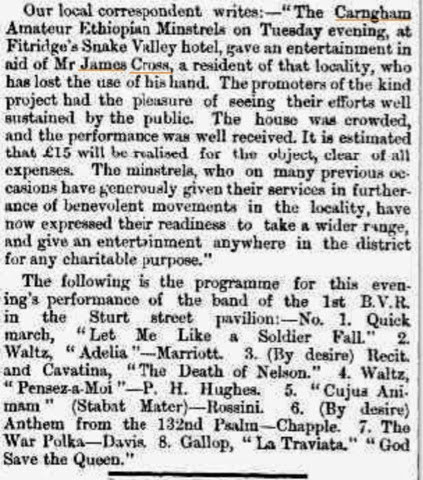 James Cross died at Carngham in 1882. Ellen Cross died in Ballarat in 1901. From Lost and almost forgotten towns of Colonial Victoria : a comprehensive analysis of Census results for Victoria, 1841-1901 by Angus B.Watson. 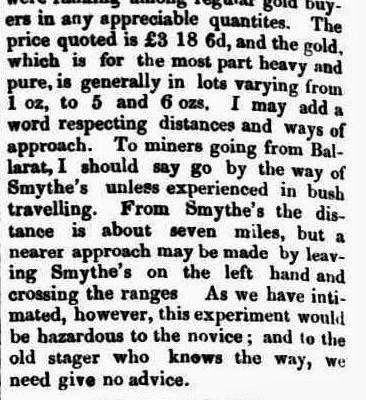 Carngham, 27 km west of Ballarat, about 30 km from Buninyong, and 4 km north of Snake Valley, was a mining township, surveyed and proclaimed in 1855. State School number 146 operated at Carngham from 1856 until 1911. Snake Valley was not proclaimed a township. It was a mining centre, surveyed as a hamlet. State School number 574, which began in 1854, is now part of the Woady Yaloak school. According to the census of 29 March 1857 there were 459 people in Carngham, 292 males and 167 females. This figure probably includes the population of Snake Valley. In 1854 there had been 58 people, 15 males and 13 females. There are no 1854 figures for Snake Valley. In 1861 there were 22 dwellings counted in Carngham with 92 people of whom 54 were male and 38 female. Snake Valley had 204 dwellings housing 714 people: 454 males and 260 females. 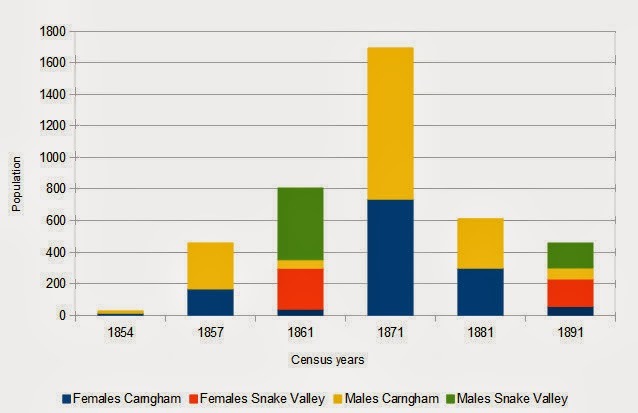 In 1871 Carngham and Snake Valley were counted together, with 384 dwellings housing 1,693 people of whom 958 were male and 735 female. In 1881 there were only 133 dwellings housing 611 people, 313 males and 298 females. In 1891 Carngham had 30 dwellings housing 126 people and Snake Valley had 92 dwellings housing 333 people. Watson, Angus B Lost & almost forgotten towns of colonial Victoria : a comprehensive anaysis of census results for Victoria, 1841-1901. Angus B. Watson and Andrew MacMillan Art & Design, [Victoria, Australia], 2003. Pages 84, 408. Today Carngham amounts to little more than a few houses where the Snake Valley – Trawalla road crosses the route from Ballarat to Beaufort. Snake Valley is still the larger settlement. Overlooking Carngham is a cemetery where James Cross, his wife Ellen and some of his children and their families are buried. The name Carngham is said to derive from the Wathawurrung people’s word for house or hut. In 1838 James and Thomas Baillie squatted there and adopted the Aboriginal place name for their property. The local clan was the Karrungum baluk or Carringum balug. Clark, Ian, and Toby Heydon. “Historical Information – Carngham.” VICNAMES. Victorian Aboriginal Corporation for Languages (State Government of Victoria), 2011. Web. 01 Oct. 2013. <http://services.land.vic.gov.au/vicnames/historicalInformation.html?method=edit&id=3226>. Snake Valley is said to have got its name when a gold miner found snakes in a shaft he was sinking. Clark, Ian, and Toby Heydon. “Historical Information – Snake Valley.” VICNAMES. Victorian Aboriginal Corporation for Languages (State Government of Victoria), 2011. Web. 01 Oct. 2013. <http://services.land.vic.gov.au/vicnames/historicalInformation.html?method=edit&id=5118>.In turn citing Porteous in Smyth 1878b: 179. A hundred and fifty years ago there were no effective antibiotics. Brandy didn’t help. 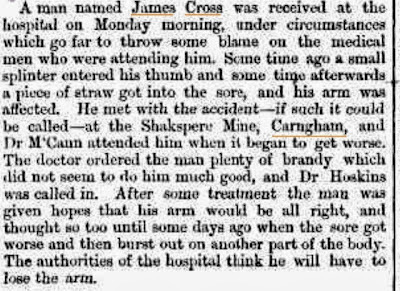 James Cross (1828 – 1882), the great great grandfather of my husband Greg, lost the use of a hand through an infection that would have healed quickly with modern antibiotics. The Genealogical Index of Names (GIN) compiled by the Genealogical Society of Victoria (GSV) includes an index record of his hospital admission. James Cross, at the time of his accident a miner, was born on 22 March 1828 at Windle, near Liverpool. I have no information about his immigration to Victoria but other sources such as his death record and newspaper notices from his brother and concerning unclaimed letters, suggest that he arrived around 1853, a date consistent with the ’16 years in the colony’ note on his hospital admission record. James Cross married Ellen Murray on 28 November 1856 at Black Lead, Bunninyong. By 1869 they had seven children, with the youngest, Mary Gore Cross, born 28 September 1868 at Carngham, less than six months old at the time of her father’s accident. 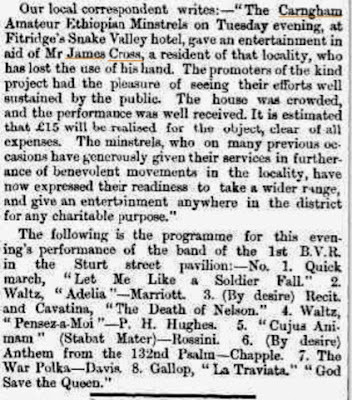 When as a result of the infection James lost the use of his hand, a local singing group called the Carngham Amateur Ethiopian Minstrels gave a charity concert to raise money for him. 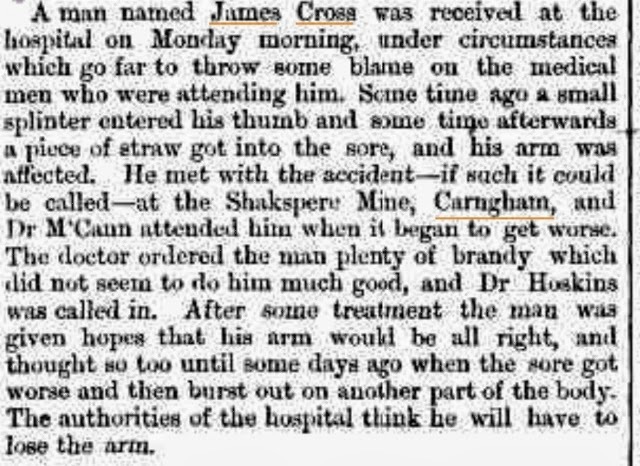 On 31 January 1882, thirteen years after this unfortunate encounter with the ineffective medical remedies of his time, James Cross died in Carngham of dysentery.